I am going to the States to visit my mother-in-law, will be back in mid-November. Before I go, I've made this smoked salmon & apple salad. Maybe due to the cooler weather, these days I keep thinking of German herring salad... longing for something rich (in taste only but not the fat content). Therefore, my salad quits the carb and mayo but still chokes full with flavors. 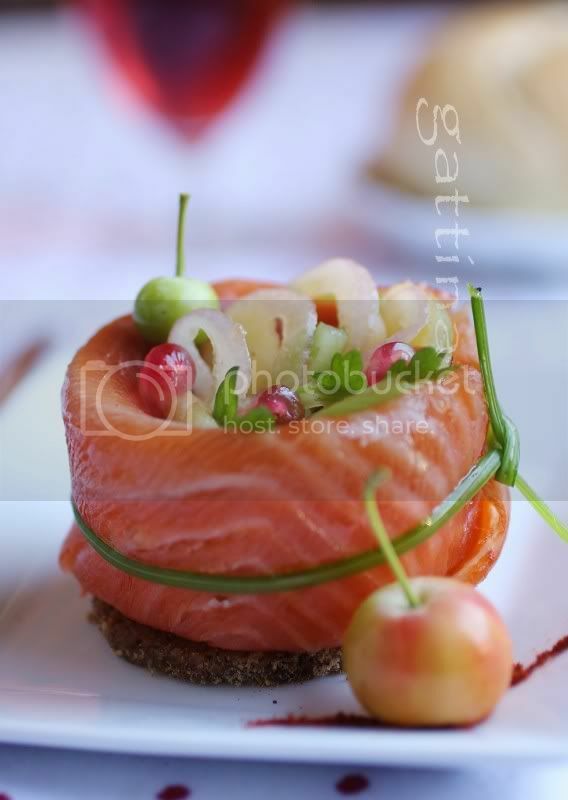 The salad includes: smoked salmon, green apple, onion, celery, pomegranate seeds and tiny ginger bits. The salad dressing is made out of: fresh pomegranate juice, ginger juice, red wine vineger, sugar, paprika and very little extra virgin olive oil. Hope you enjoy this salad, and happy Halloween! Have a good time in the US and see you in November! That salad looks so pretty! wow! that looks really really good. I will try to make it tommorow. What a pretty plate. Simple elegance. This looks beautiful, Gattina! And your photography never ceases to impress me :)! Looks so elegant! Have fun! my kids will love this esp salmon! thank you! MMMMMMMM,..what a great & tasty salad!! Yummie food!! I love your well flavoured dressing too! Have a great break!! We will be waiting when you get back: Have fun! comforting, soothing, downright good. .